The 500 pound gorilla of the summer box office has arrived. Having sufficiently chased off all other movies from its own weekend, and anything of real quality from the weekends of either side of it, the pressure is all on Transformers to prove it's worth the fuss of all this. With July 4th falling on an awkward day for box office this year, this has become the defacto peak opener weekend, and has been granted to Transformers: Insert Subtitle Here. 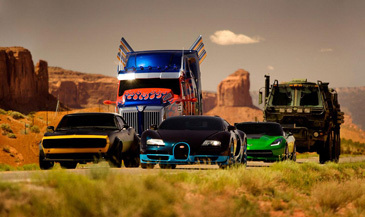 Michael Bay brings us the fourth entry in the visual and auditory assault on the senses that is this franchise, but the one question on everyone's mind is: can it survive the departure of Shia La... Okay, I just couldn't get through that sentence. So yeah, the series has finally decided to stop lugging the corpse of Shia LaBeouf's career around, and replaced him as the human protagonist, with a real star, Mark Wahlberg. Playing perhaps the least convincing Texan in cinema history, he discovers the scraps of what turns out to be Optimus Prime and reassembles him, setting in motion a new conflict between the Autobots and the Decepticons for something something magic cube probably. Look, here's some Dinobots! (This script meeting transcript brought to you by “Explosions!”) The plot, such as it is, sees all Transformers viewed as enemies to mankind, given their penchant for destroying the place when they fight, which is often. So after reactivating Optimus, Wahlberg and his family are sent on the run from sinister government agents (led by Kelsey Grammar, who does a 180 from his X-Men attitude of “different powers must be embraced” to “difference must be destroyed!” Which is it, Kelsey?) intent on destroying the Transformers and fashioning them into weapons for humanity's use. But then, rigid adherence to the three act structure isn't what you come to these films for – rather, it's the non-stop (even when it probably should) action sequences and pandering to childhood memories, combined with awkward and inappropriate humor. That is what you come to them for, right? I could list all the other human actors in the film like Stanley Tucci, TJ Miller and Sophia Myles, but they don't make a lick of difference to the appeal of it. Each of the previous films made boatloads of money, with the second passing $400 million. That the third film was a drop from that height probably points towards just how epically terrible the second film was, and soured people on the franchise, if only a little bit. Early word on this says “not as bad as two, a little worse than three”, if that in any way matters to you. In many ways, this is a very cynical film, made not because Michael Bay had any particular story he wanted to tell about giant transforming robots, but because people respond well to “ooh, shiny” and “hey, I remember that bit from the cartoon!” All three films had massive opening weekends, although they've all usually been modified in some fashion. This is as close to a “pure” opening weekend as this series has had (though there is the de rigeur Thursday evening sneak), and should translate into a higher three day total, around $107 million this weekend.